Four people were killed in landslides and thousand others fled their homes after tropical low pressure formerly called Usman swept through the central Philippine islands on December 29. Three members of a family were buried in a landslide in Lagazpi city in the southeast of Manila, while a woman was crushed by another landslide in Bulan town as heavy rains loosened the earth. Some 12,000 people in Bicol region were evacuated after the low pressure area hit the eastern side of the country. Packing maximum winds of 65 kilometres per hour, the weather disturbance was charted as moving west across the central islands at 10 kilometres per hour, and was expected to be over the East Sea on December 30. 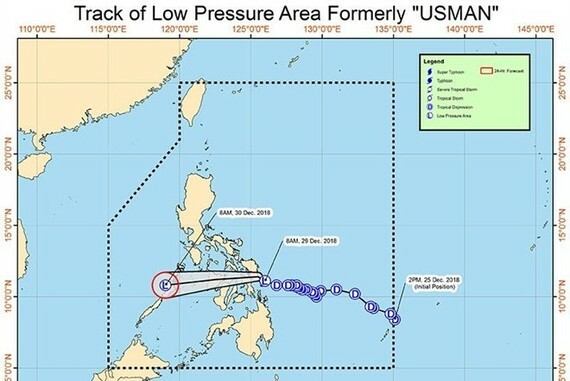 Although Usman’s winds were not too powerful, it still brought heavy rains that caused landslides and flooding in areas it traversed, the civil defence office said.